Bell Tech dropped spindles… – Industrial Chassis Inc.
Richard D brought his frame in for us to straighten last weekend. He also asked us to install the crossmember kit (006) and hang all the components. With the parts he brought were a brand new pair of dropped spindles from Bell Tech. It looks as if they did a nice redesign of the old spindle. It wasn’t apparent at first whether they fixed the steering arm location issue or not. Installation confirmed they have not, if anything has changed it is for the worse. The steering arm has been raised over an inch over stock and shortened. It also appears they have moved the arm location outboard more but have also changed the angle of the tie rod end boss. The machine work is not up to correct tolerance either. All three tapers are bored too deep into the bosses, note how much thread is exposed on the Bell Tech spindle tie rod end vs the stock spindle. 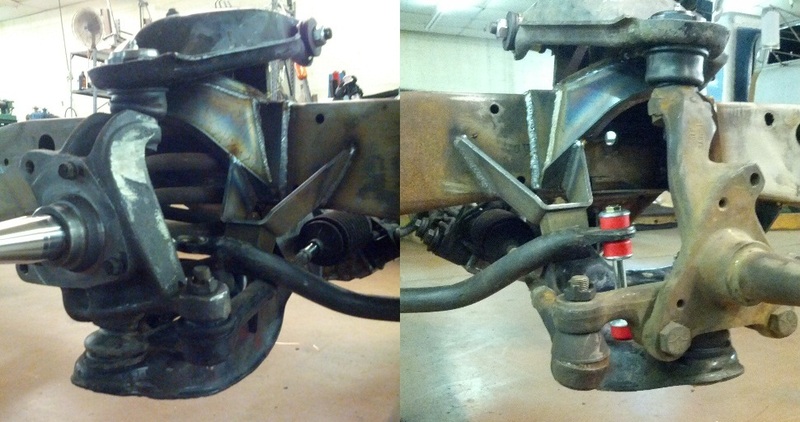 This also raises the tie rod up farther causing more interference with the anti-roll bar and increases bumpsteer. Note the location of the tie rod in relation to the lower ball joint, notice the one on the left (Bell Tech) is much higher than the one on the right. Also notice the tie rod contacts the anti-roll bar. These spindles are still going to need the tie rod drop I detailed on my Dakota Based IFS Tech page.